Last May of this year when my kid visit me here in Baguio, he was very curious and asked me to visit the official residences of the President of our country in Baguio City. I know for sure that you know what I’m talking about, of course, the famous “The Mansion”. 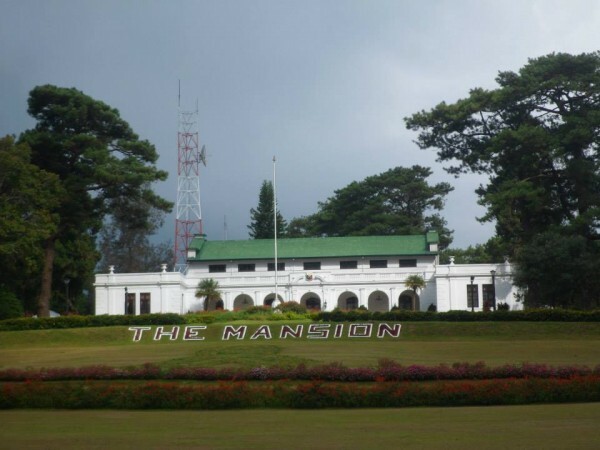 The Mansion or the Mansion House is located in the eastern part of Baguio City, accessing C.P. Romulo Drive and across the Wright Park. As one of the oldest structure in the city, it is also the most favorite site for photographed and sightseeing. The place is also the most visited landmarks in the city because it was said that the main gate is the replica of the gate at Buckingham Palace in London, England. It has a circular driveway with a marvelous gardens and a well-maintained lawn. There is a mini museum which has the housing memorabilia and art works that has been collected by the former president in their occupancy. The two story building that serves as the official residences of the Philippine President in Baguio City was formerly the summer homes for U.S. Governor-generals during the American Administration. There is also a small amphitheater that is adjacent in the compound. Philippine Marines contingent maintains the security of the whole compound and you will notice some of them manning the guardhouse along the vicinity of the Mansion’s gate. It is open to the public from Monday to Sunday but during the stay of the President, the Mansion is closed for public because of security reason. If by car, you will pass though the Teachers Camp and the Baguio City Botanical Garden along Leonard Wood Road. When you reach the Pacdal Circle, go towards the Wright Park Drive which is directly across the Mansion. If by taxi, you can tell the driver to take you to the Mansion or Mansion House and the fare cost is around 60-70 pesos from Session Road. If by jeepney, you can go to the Mabini street jeepney terminal and take the Plaza-Mines View jeepney and the fare cost is 10 pesos per person.